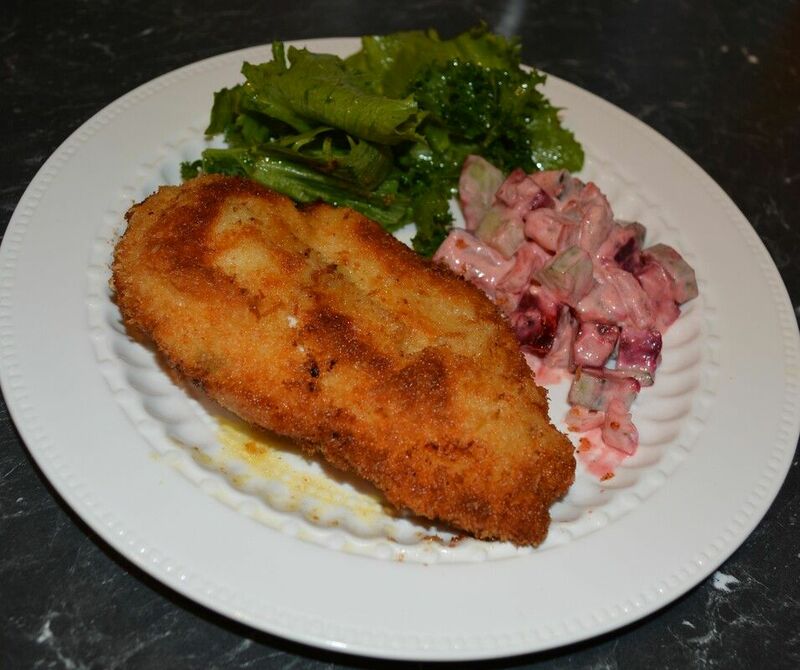 Here is a recipe that I had heard about for a really long time, I mean who hasn't heard of chicken kiev. Well I finally got around to making it when our Eating Around the World Adventure took us to Ukraine. This was delicious, I mean who doesn't love a schnitzel, and what could make a humble schnitzel even better, add some flavoured butter in the middle. This was crisp, this was juicy, this was a great dish. Now the chicken breast. I am not a true lover of the chicken breast, I much prefer the thigh and leg. But I am a convert, I now know how I like to cook a chicken breast. Let me explain. Think Cordon Bleu, chicken breast stuffed with ham and cheese, I tried it a few times and I always found the end result ordinary, the chicken would be dry as it's rolled, so it's thick, the outside overcooks to ensure the middle gets cooked. The filling would be nice, but it was also always such a huge portion, I mean a whole chicken breast is a lot. Well with the recipe I found for chicken Kiev, Natasha would "Using a sharp slim knife, cut chicken breasts in half lengthwise, keeping both halves about equal in size and thickness". Now that may seem like I should have known that, but I didn't. So now my Chicken Breast is half the size, my kind of portion, makes for faster cooking, no dry breasts anymore, no pounding meat to flatten it. I can't wait to make cordon bleu this way to. ​Now there was one problem, I can't cut with such precision, so I would get one great breast and one not so great breast. But that was okay, so if you are like me, and your knife skills are not perfect, I just bought five breasts (as there are five of us), I used my five good halves for the chicken kiev and my not so good halves, I cut into strips or nugget shapes and froze them for when I need a simple dinner of chicken schnitzel fingers or preztel crusted chicken fingers. If you freeze them flat, they defrost quickly and you have a dinner in the freezer for when you can't get to a shop. You could even freeze them crumbed, not with pretzels though, normal crumb and you have prepped another meal for another day. You have no idea how great this is, until you have a houseful of your kids friends over and you have this ready to go in the freezer. Another thought if you have kids that don't like garlic butter, just make the not so perfect halves plain schnitzels for them. Here is a video you should watch, it is where I got the recipe from www.youtube.com/watch?v=vX1fq-XcNMQ. Watch it especially if you are new to cooking, this shows you how it's done. 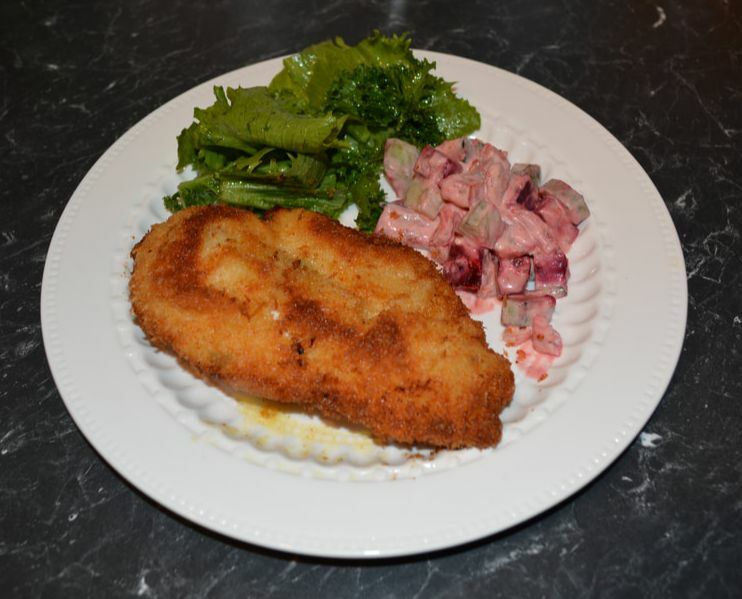 So here is a delicious simple dinner idea that my family loved. Hope your family loves it to. Make the Lemon Herb Garlic Butter: In a medium bowl, mash together all Kiev butter ingredients with a fork, just until lemon juice is incorporated into the butter. It takes a couple minutes but it does come together. Using a sharp slim knife, cut chicken breasts in half lengthwise, keeping both halves equal in size and thickness. Carefully cut a pocket into the side of each chicken breast as deep and wide as you can go without cutting through the chicken breast (about a 5 x 7cm pocket). Stuff each chicken breast with 1 tablespoon of the lemon herb garlic butter butter then close the pocket and push over the top of chicken breast to disperse butter. Pinch the opening to seal. Season both sides of chicken breast with salt and pepper. Get three bowls large enough to fit a chicken breast. In one bowl ad the flour, in the second bowl add the eggs, beat until well combined, in the third bowl add the breadcrumbs. Dust chicken in flour, dusting off excess, then dip in eggs making sure to get a good egg coating all around and letting any excess egg drip off. Finally dip into the bread crumbs, crumb it well. Transfer to a plate while crumbing the remaining chicken breasts. Add about 1cm of oil to a large deep frying pan and place over medium heat. Once the oil is hot (a bread crumb should sizzle when you add it to the pan), add the chicken in a single layer and fry until golden brown (4 min per side). Repeat with second batch. Season hot fried chicken with a sprinkle of salt. ​Serve hot with some extra lemon wedges and a green salad.